After the thrilling night sleeping in the family ger we rose early, our host was already out tending his animals. Bread was toasting on the ger’s stove, breakfast was devoured. We brushed our teeth in the icy outdoors and were soon bundled into our little grey van along with the sleeping bags and food. Bidding farewell to the family we set off under blue sky across the desert toward our next destination, Bayanzag. 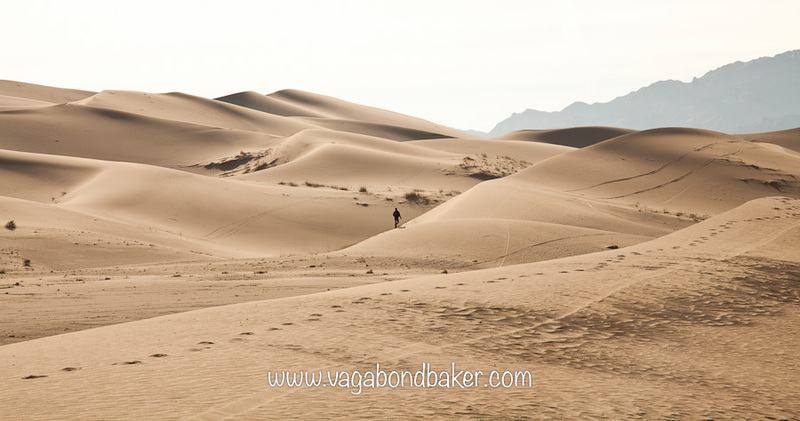 The scenery was so dramatic, scrubby dry land edged with low mountain ranges. The desert is far from lifeless, there as so many small birds flitting in large flocks across the tracks. They scatter from the van in their thousands, twittering. We saw many isolated herds of horses and a bushy tailed fox. 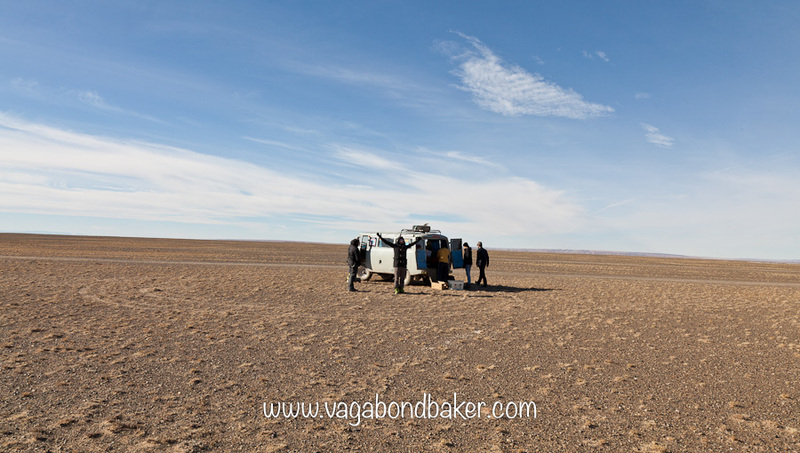 There were no specific roads, just many wheel tracks spread across the plain, Bata – our driver – instinctively knew the way. We stopped for a short time at a tiny village where there was an old Buddhist Temple, Bata got playful and started a snowball fight! We reached an extremely wide, featureless and bird-less plain, the van ground to a halt. From the noise we knew this didn’t sound good. We had broken down. Bata got his tools out – he was a carrying a garage-worth under the seats – and started to tinker. After a while it looked a lot more serious than we hoped and Badmaa made us some lunch. 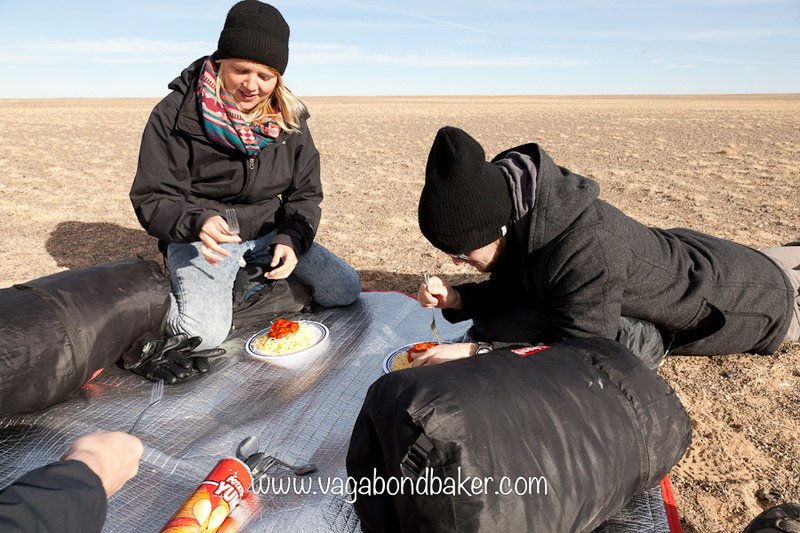 This was certainly a contender one of the more random moments of the trip: we sat on a makeshift picnic blanket, weighed down with rocks, in this empty corner of the Gobi desert eating hot spaghetti and tomato sauce! Bata showed us the problem, it was the clutch. He needed to get the van to a village so he could work on it, he had the part but needed more tools. A truck arrived and the van was tethered to it with a metal cable. The five of us were squeezed into the tow truck which also contained our rescuer’s entire family! That night we were accommodated in a sparse dorm room in the small, dusty village of Mandalovoo. Vodka, beer and cards, this may not have been a ger but we made the most of it and had a hilarious evening. Bata worked through the night, coming to bed at 5am and heading back out just after 6. We had eaten breakfast before we heard the van rumble back into life. 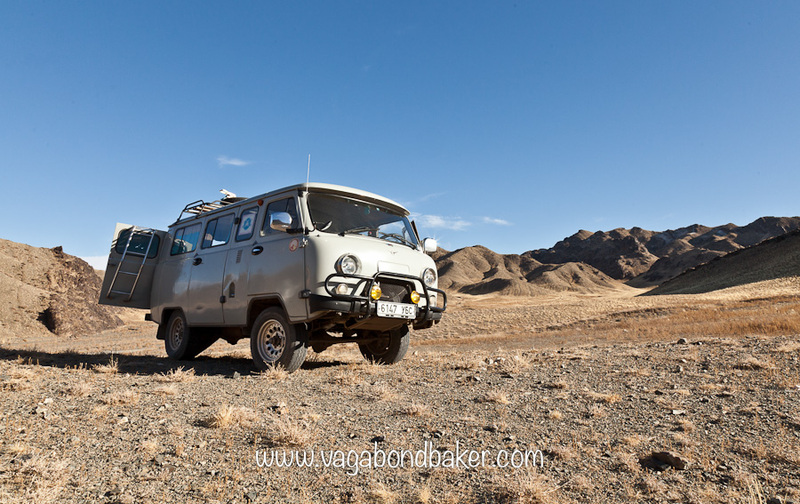 These little Soviet Uaz vans are indestructible! And Bata was a hero, he really didn’t need to apologize! 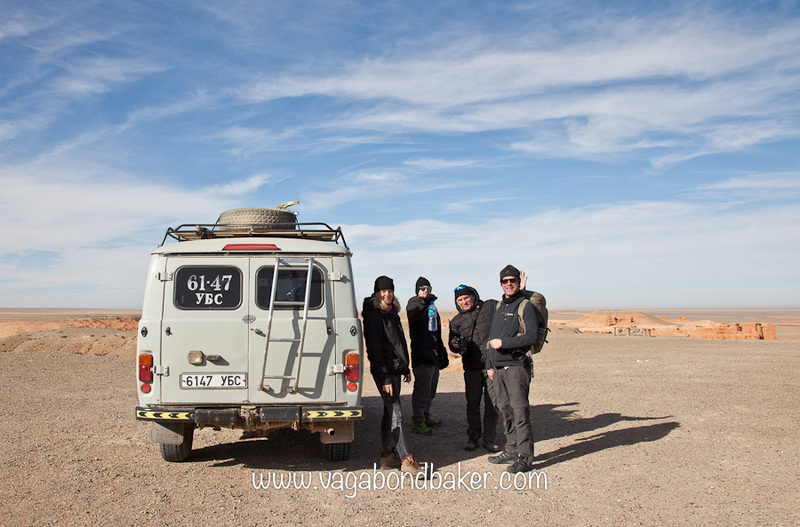 Back on the road, well the track, we headed for Bayanzag, the Flaming Cliffs. These red rock cliffs rising up out of a magnificent landscape are famed for the huge number of fossils and dinosaur bones that have been unearthed there, the cliffs were excavated in 1922 by Roy Chapman Andrews. 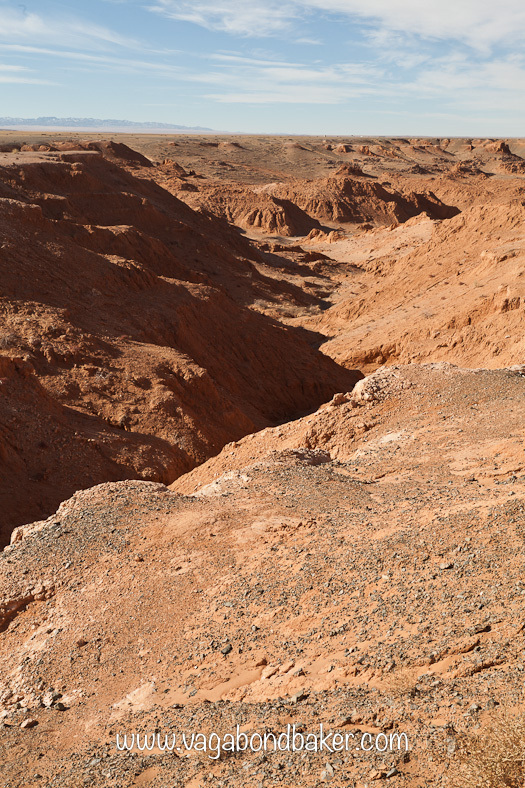 They are more like a raised gorge, a red rock burning up from the sands with views over the empty plains. It was mightily windy up on the cliffs, it sure blew away the cobwebs of the night before. We climbed and explored, eager to find a fossil or a dinosaur egg. The vista was spectacular, one of those views that makes you feel like a tiny speck on the landscape. Thoroughly windswept, we climbed back into the van and we set of southwards. The desert here is so varied and constantly changing. Our journey took us through a narrow rocky valley between the mountains, sheltered from the wind we pulled over and had some lunch. A chilly picnic among the rocks, a vulture circled above us. The track continued over a mountain pass into the next valley, from this high vantage point we could see the Khongoryn Sand Dunes in the distance, running along the edge of the mountains on the other side of the valley. The sun cast long rippled shadows across them. Not far from the dunes lay a tourist Ger Camp, very quiet at this late time of the year. Our little group was allocated two gers, Chris and I got one to ourselves! 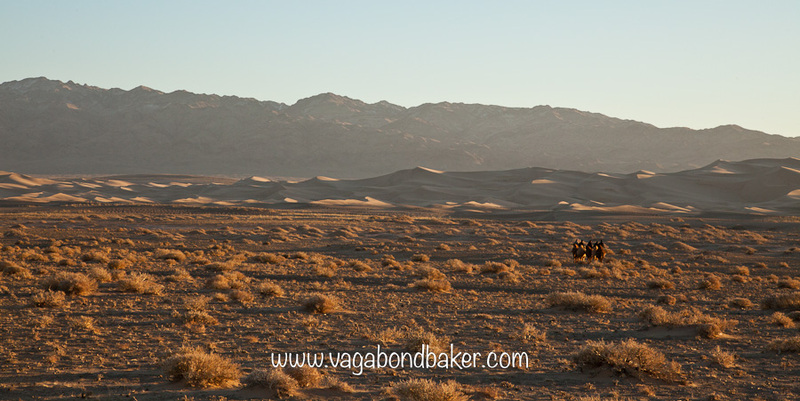 The stay included a camel ride out to the dunes, the sun was setting as the camels padded softly off. I opted not to ride and followed behind them on foot for a bit. 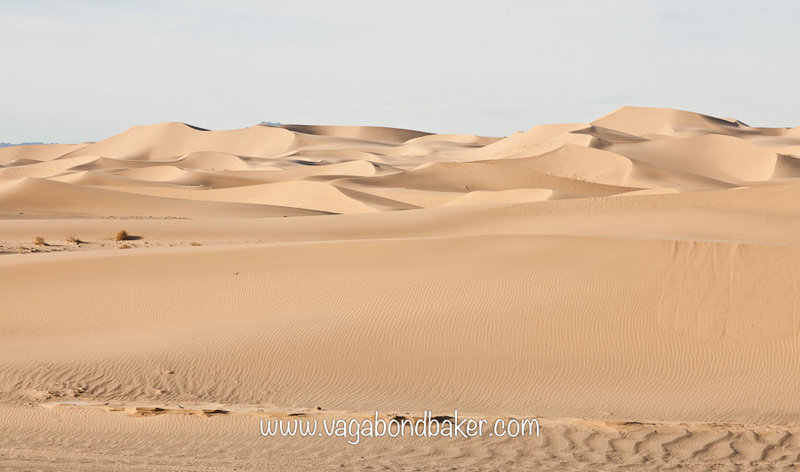 It was wonderful to be alone, the desert surrounding me, the ger camp on the horizon. The sun was balanced on the mountain ridge, so low the shadows cast by the spindly shrubs were long and dramatic. As it slipped behind the ridge I walked back to the camp and waited for the rest of the group to return. An evening of cards and a splash of vodka ended the day. Solitude, the camels in the distance. The camels hadn’t made it to the dunes before sunset so the following morning Bata drove us right up to them, expertly handling the little van in the deep sand. They were quite amazing up close, sculpted by the wind into waves and ridges. They ‘sing’ when the wind blows across them, alas it was a still day, silent. We became children, we ran up, we slid down, we threw ourselves off until our shoes and pockets were full of sand. 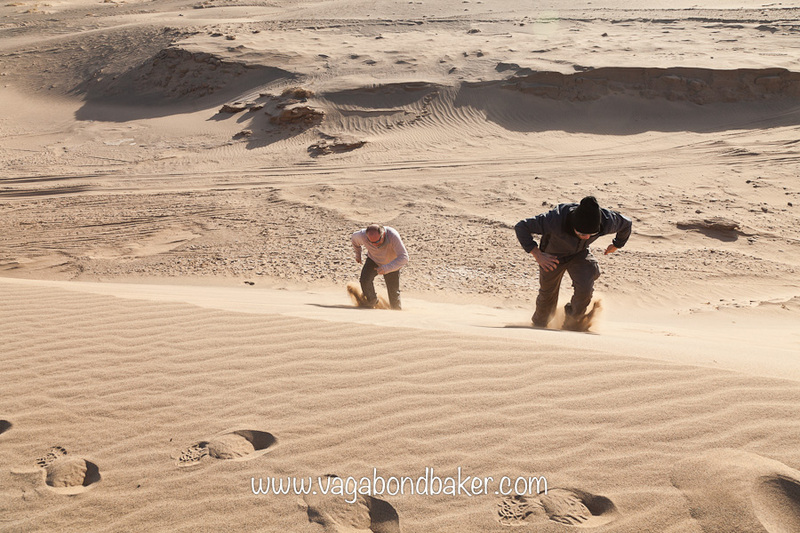 It was fun to expel some energy before another long journey across the desert in the van.. 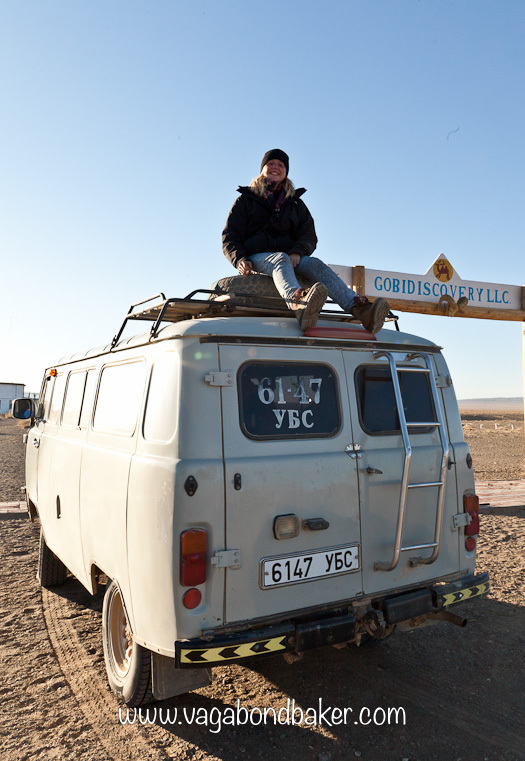 There Are No Roadsigns In The Gobi Desert: Part 1 Sleeping in a ger with a nomadic family, in the desert: magical! 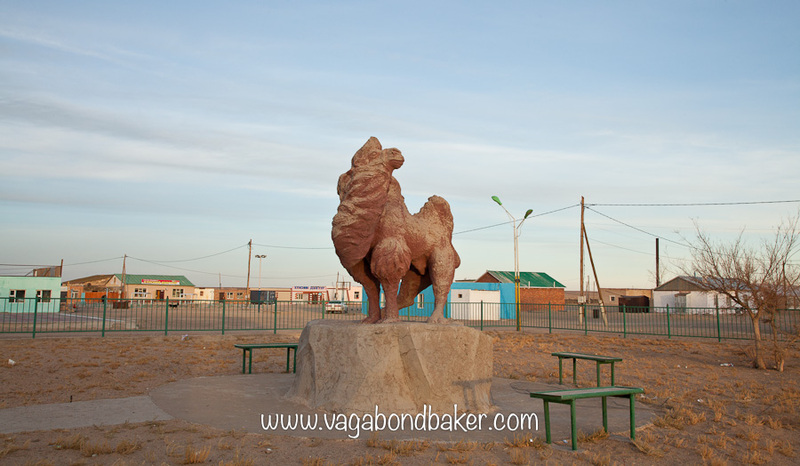 There Are No Roadsigns In The Gobi Desert: Part 3 Waking up to deep snow at the valley of the vultures. 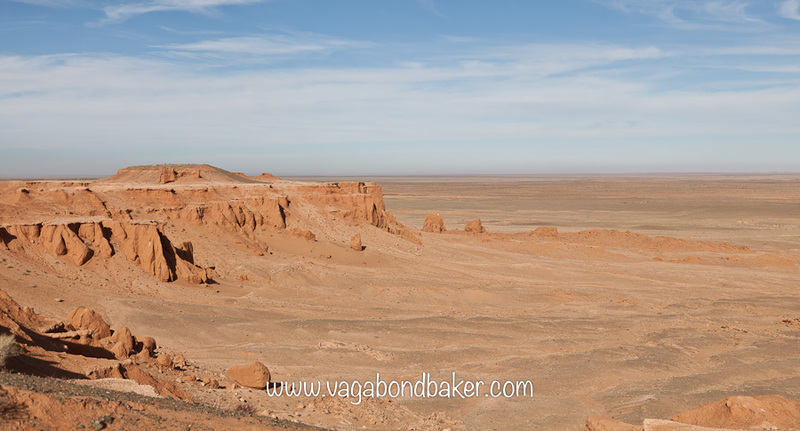 There Are No Roadsigns In The Gobi Desert: Part 4 Spectacular rocks and cards by candlelight. 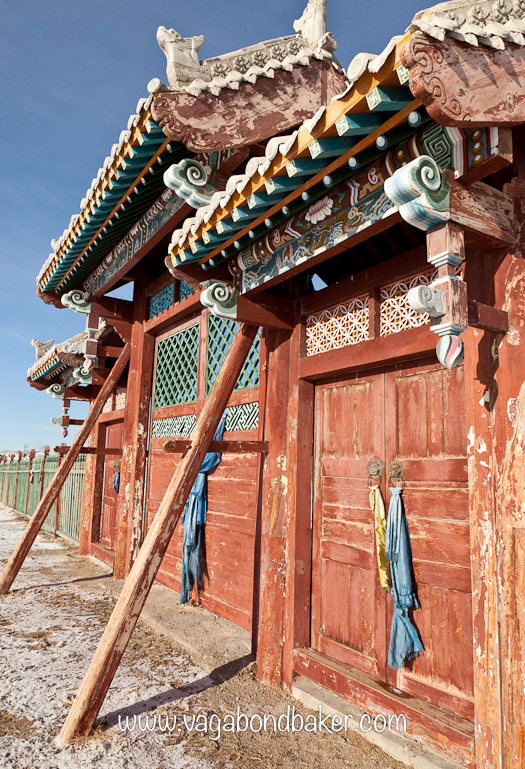 Hello Mongolia! Arriving by train into Ulaanbaatar on Chenggis Khan’s birthday! How very auspicious! Crossing Siberia By Train, Fulfilling a Dream Yekaterinburg to Irkutsk, and one very boozy Russian experience. Yes, we did sing Bohemian Rhapsody to two bemused Russians. Oh dear! haha, yup. We need to switch! Summer for me, winter for you guys! I was wondering what might happen in the middle of nowhere if the van broke down, now I know! So did Bata have cell phone service to call the tow truck? How long did you wait for it to arrive? Sounds like Bata is extremely resourceful and able to handle anything that might come up! 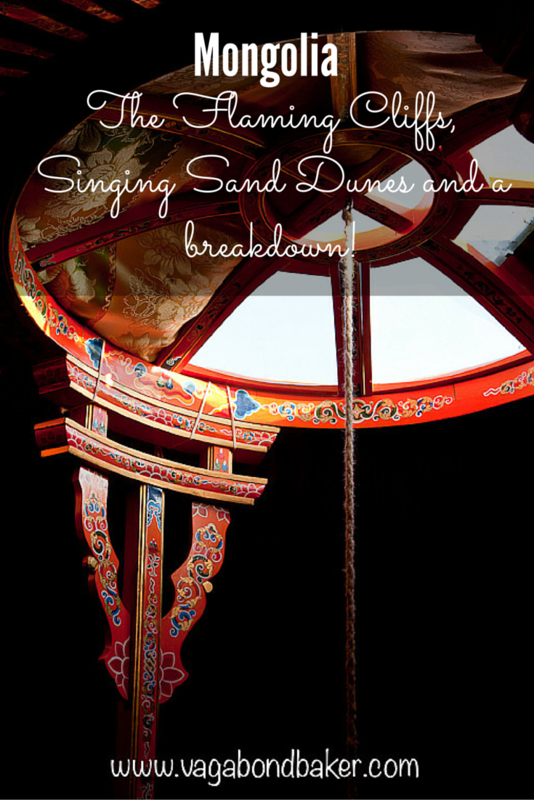 I love your pics of the Flaming Cliffs and of the inside ceiling of the ger with rope hanging down. 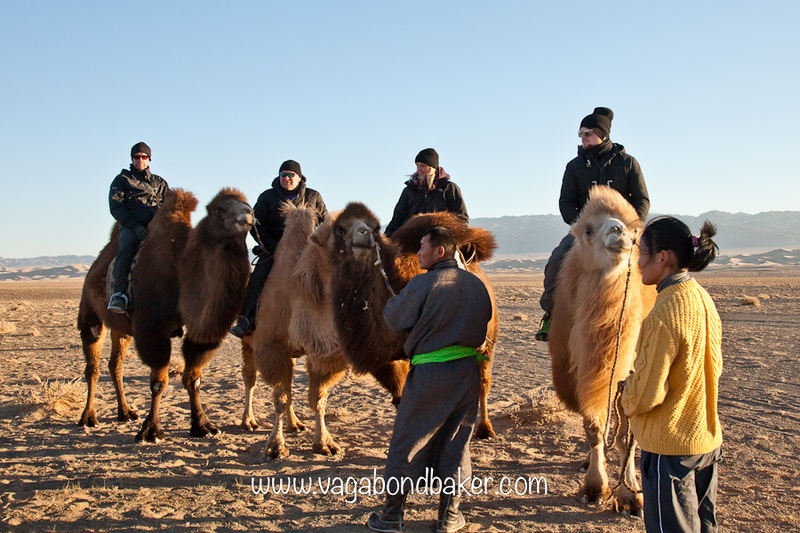 And very interesting to ride on those camels, they are much smaller and shaggier than the ones we saw in Morocco! Yes, Bata had an old-school mobile phone, a dinky little thing that he often used while driving, either to chat or text (not alarming at all!). 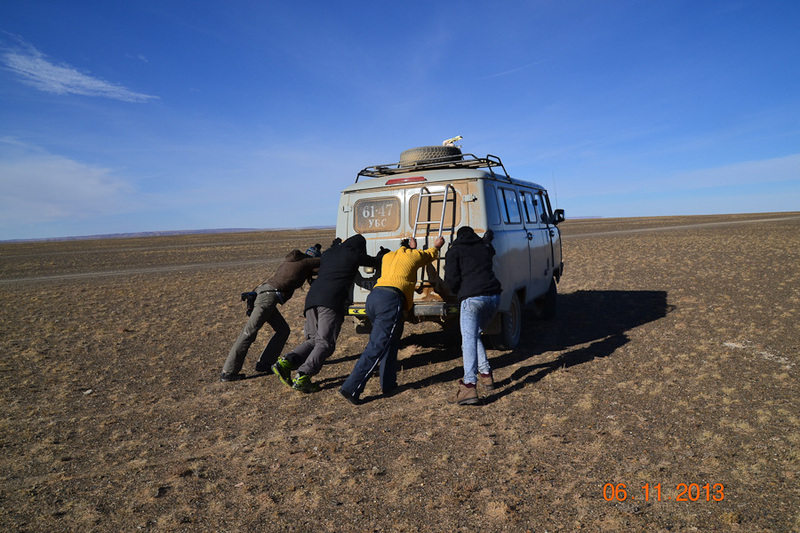 Plus we all had phones, Chris had a Mongolian sim card too mind you we had no way of charging them until we broke down and got to stay in the village, electricity! We waited about an hour after he called, it wasn’t too much of a problem, we were used to the laid back time of the desert. We had each other, and books, took photographs…. He is incredibly resourceful, thats why they use these old vans, they can be fixed easily without the need to plug them into a computer. Bit like the old VW buses. He carried so many spare parts and tools under the seats. You have to be, the environment is so harsh. The horses are so much smaller too, everything gets shaggy in the winter! 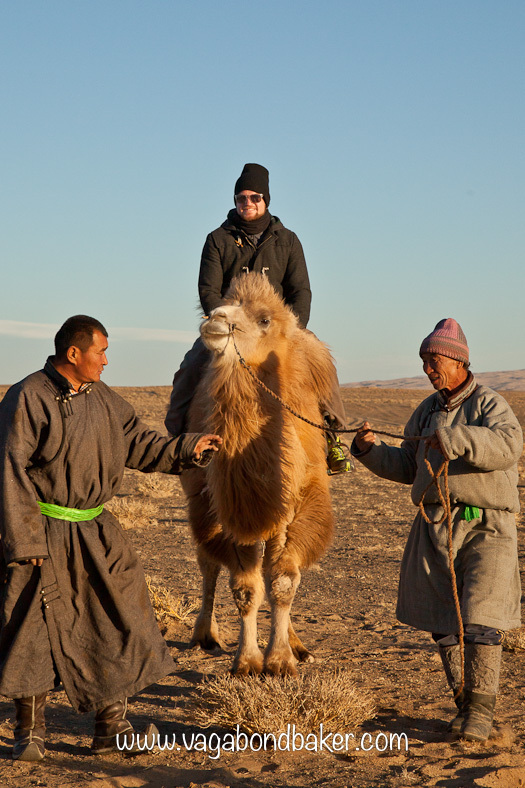 You must go travelling in Mongolia guys, you have to repeat this adventure of ours!